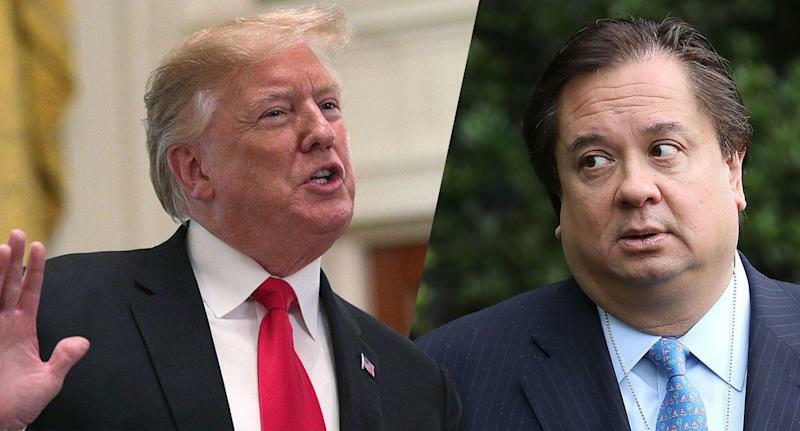 President Trump on Tuesday called George Conway, a prominent conservative lawyer and the husband of White House counselor Kellyanne Conway, “a total loser” after he questioned the president’s mental health. “His condition is getting worse,” George Conway tweeted after posting sections of the “Diagnostic and Statistical Manual of Mental Disorders” to his Twitter feed. In fact, Conway, in the early days of Trump’s presidency, was offered a top job at the Justice Department as chief of the civil division — a post that would have put him in charge of defending the Trump administration in lawsuits throughout the country. Conway has used his Twitter feed and occasional op-ed essays to defend against Trump’s attacks on the rule of law — and lately to point out what he sees as the president’s instability. Earlier this month, Conway called for a “serious inquiry” into Trump’s state of mind. “Look, my wife did an amazing thing,” he said. “She basically got this guy elected." On Tuesday, Conway told the Washington Post he remained proud of his wife and was not "jealous" of her. But he also said that he wished she did not work for the White House.